[Episcopal News Service] The Diocese of Olympia has launched a video series that collects the first-person stories of Episcopalians who were among the Japanese-Americans sent to internment camps during a period of heightened xenophobia and racism at the start of World War II. The federal policy was enacted by President Franklin Roosevelt by executive order on Feb. 19, 1942, and it uprooted 117,000 people of Japanese descent, about two-thirds of them U.S. citizens. Men, women and children were relocated out of what the government defined as the Pacific military zone along the West Coast to inland “assembly centers” and eventually relocation camps. The forced exodus from Seattle prompted the temporary closure of St. Peter’s Episcopal Church, a historically Japanese-American congregation that 75 years later helped spearhead the Diocese of Olympia’s video series. The diocese’s videographers recorded hours of footage, interviewing 17 people for the series, “Justice Interrupted.” The result is five 10- to 15-minute videos, the first of which was released Feb. 22. 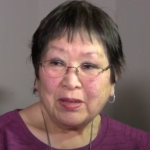 Jan Kumasaka is interviewed in the first video of the “Justice Interrupted” series. Her family spent four months in a camp before taking advantage of an opportunity to resettle in Montana. The government would allow release from the internment camps if families were willing to resettle further inland and could find jobs, but the other families spent most of the war at camps scattered around the country, from Idaho to Arkansas. The Japanese internment camps are a significant part of the history of the Pacific Northwest because of its large Asian-American population, Olympia Bishop Greg Rickel told Episcopal News Service, and the passage of time has not minimized the injustice. He pointed to the Trump administration policies seeking to curtail immigration and refugee resettlement. The Diocese of Olympia joined the American Civil Liberties Union in filing a lawsuit in February 2017 opposing President Donald Trump’s ban on refugees from seven majority Muslim nations. During World War II, proponents of internment justified it as a military precaution, guarding against Japanese immigrants and Americans of Japanese descent who might secretly work to support Japan in the Pacific theater of the war. Defenders of internment also argued that it also would protect those detained from racial attacks, though such arguments were undercut by conditions at the internment camps, which resembled prisons more than safe havens. St. Peter’s Episcopal Church has been highlighting some of that history since last year to mark 75 years since Roosevelt’s executive order. The congregation was formed in 1908 by a group of Japanese Anglicans, who met in houses until raising enough money to buy property in Seattle in 1932 to build a church. When the congregation’s families were forced to relocate to internment camps, the church closed on April 26, 1942, and didn’t reopen for more than three years. 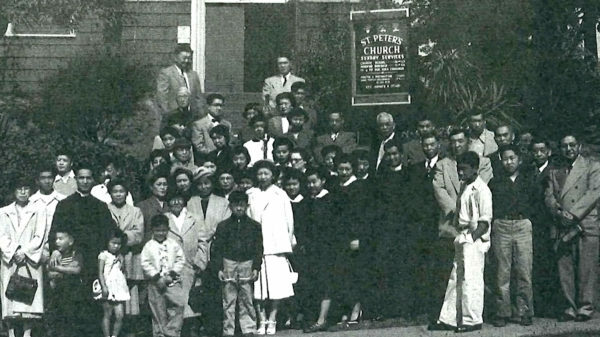 Other historically Japanese-American congregations have similar stories of upheaval during the war, such as Christ Church Sei Ko Kai in San Francisco and St. Mary’s Episcopal Church in Los Angeles. Two priests from St. Mary’s, the Rev. John Misao Yamazaki and his son, the Rev. John H. M. Yamazaki, followed the majority of their congregation to the camps and continued to lead worship services there. The Episcopal Church also celebrates the work of the Rev. Hiram Hisanori Kano, who ministered to fellow internees and the guards at four internment camps during the war. He is included in the calendar of commemorations known as “Holy Women, Holy Men” on Oct. 24. Rickel noted how the Japanese internment’s impact on such congregations also highlights how Episcopalians have been divided too often along ethnic lines. “We regret the actions of our country then and pray regarding similar actions being taken today, praying that we as a people do not make a similar mistake in this generation,” he said in an introductory video for the series. Future installments are expected to be released throughout the year, about every two months. Aside from the endlessly-debated question of whether the internment camps were justified at the time given the threat from Japan, what is the point of raising the issue yet again. Is it simply to give Japanese-American Episcopalians the opportunity to claim victim status for themselves or, more likely, is it just to add to the onslaught directed at President Trump’s immigration policy? Probably both. Once again, David, I find my viewpoint very much misinterpreted. It so happens that I have made several trips to Japan, have traveled widely in that country and admire the Japanese in many ways. Indeed, one of my best friends has been a much younger Japanese fellow with whom I once shared quarters in a Scottish youth hostel. I facilitated a trip he made to Massachusetts and he has for several years been working (legally!) at a large bonsai business near the Rhode Island border. As a one-year old I was living with my parents in Seattle at the time of the Pearl Harbor bombing. My parents remembered seeing Japanese freighters loaded with scrap metal leaving the Seattle waterfront days before. Of course plenty of innocents were hurt by the internments but I rather imagine that if I had lost someone close to me at Pearl Harbor or on the battlefront I might have been very much in favor of the camps. For the most part Japanese-Americans may have been loyal Americans, as you suggest, but there were a good many who were not. Fact is that many distinguished historians continue to believe that the camps were justified under the circumstances of the time. But you have not responded to my main point which was to suggest that this latest controversy is yet another sad example of how the Episcopal Church has in recent years turned itself into a largely leftwing political organization with goals that far transcend its legitimate mission which, to put it simply, is to save souls. If the church continues in this direction then ultimately it will run out of souls to save. David, I’m sure that some want to see correlations about Trump’s immigration policies and the Japanese internment 70 years ago. I’m sure that Bishop Rickel looks through that viewfinder. It is hysteria without evidence. Mr. Trump is oafish and a boor at times but an investigative journalist would also quickly find that Trump’s immigration policies are the laws on the books passed by Congress but which are not being enforced. His views are views publicly spoken many times by Mr Obama, Mrs Clinton and a long list of liberal Democrats. Investigate their old speeches and its all there in Technicolor and stereo sound. Border security isn’t racism. Enforcing current immigration law isn’t white supremacy. The truth is that digging away and festering up old grievances pays. Was Japanese internment wrong? Yes. Was it a mishandled war measure? Yes. Should we keep alive a 70 year old grievance long after its affected citizens have long-ago moved on and have prospered by the efforts of a self-correcting nation? No. I echo Doug’s comments. Trump is a doofus and coarse sometimes, but for Rickel to compare the motivation and ideology behind his refugee number policy and vetting policy is beyond the pale. That is textbook bearing false witness against thy neighbor and unbecoming of an otherwise decent bishop. Bishop Rickel…you are better than this. May God move your heart to retract your statement. Doug and Richard I think it is important for people to speak up before this whole immigration thing gets out of hand. Rather than trying to bring the country together Donald Trump and his supporters seem to be trying to tear it apart. The original motto of the United States (which is still on the Great Seal of the USA) is E Pluribus Urium (Out of many, one) . The president’s executive order — that has come to be known as the Muslim ban — was not a “law on the books,” and was indeed struck down by various courts. It was opposed by numerous religious organizations as well as our judiciary. I believe this way of looking at other humans, also created in the image of God, not as neighbor but as “the other” is what is concerning. Lowering the number of refugees we’re allowed to help is… well, I can’t think of a decent word to use. So in these times I see no problem in reminding ourselves what can happen when we divide and diminish members of our human family. Mr. Oberdorfer, I wonder where you live. Just as the West Coast lashed out at Japanese-Americans, the East Coast was very leery of both Italian- and German-Americans. It was harder for the Good Guys, because Germans and Italians are white, while Japanese are very obviously “other”. You can change your name from Longo to Long, or Schmidt to Smith, and presto! you fit right in. Jobs were hard to find, people who had worked at factories found themselves without , the police confiscated radios. Yes, that happened in Baltimore! Americans are not always very nice people. As far as the church’s position on immigration, the Bible is very, very clear. We are to treat the stranger in our midst. Matthew 25 tells us we are to treat strangers as if they are Christ, Himself. St. Paul’s letter to the Hebrews reminds us to welcome strangers, for they may be angels in disguise. In order to save souls, we must first befriend them, and we cannot do that when we treat people shamefully. The Japanese taking into custody were Christians. They clearly did not believe the Emperor was God. The people Obama was bringing in were Muslims. All the people committing terror have come from that religion. Even then the people getting greater examination come form regions in chaos so we could not be sure who they were. To Dani Rice: To answer your question, my home has always been near Boston though as a bachelor I have used the opportunity to travel to far more corners of the world than most people. My parents emigrated to this country from Germany in 1934 so it would be illogical for me to have anything against immigration per se. I do not believe they ever experienced anti-German prejudice either in Boston or Seattle but if they had I’m sure they would have argued that during the war years it was to be expected and quite understandable. Of course I’m not in favor of treating people “shamefully” but that doesn’t mean we should constantly be digging up and bemoaning past history for essentially political reasons. In particular I resent the worsening habit of the Episcopal Church to ignore the distinction between church and state in so many of its activities. We use the pulpit regularly to urge governmental actions that really are none of our business. At the same time we pay little attention to the extent to which government is constantly intruding in traditionally religious matters. The lovely creche that used to appear in December on the lawn before our town hall is long gone of course. Is it just a matter of time before General Convention will vote to require Episcopal priests to wish their parishioners “Happy Holidays” instead of “Merry Christmas” so as not to offend anyone including non-Episcopalians? One of the points for raising the issue of internment camps again is simply the anniversary date and the need to keep this disappointing aspect of World War II history alive. As more and more internment survivors pass away (at least 3 have passed away at St. Mary’s Mariposa, Los Angeles in the past 3 months) it is vital to keep their memories alive. To tell their stories with integrity and purpose is a valid and vital activity for the Christian community. To change the subject, I was very disappointed to see that the ENS article mentioned the clergy who ministered to their congregations in the camps, but omitted any acknowledgement of Deaconess Margaret Peppers who had been working at St. Peter’s before internment and followed her congregation to Minidoka where she worked until the camp closed. As the great grandson of the Reverend Canon Gennosuke Shoji pictured above at St. Peter’s Episcopal Parish, I am so ashamed to see members of the Episcopal Church trying to paint incarceration of Japanese Americans during WWII as justified. It doesn’t matter if some were disloyal, or if some refused to cooperate with the immoral and unconstitutional Executive Order 9066 that led to their imprisonment. Japanese Americans and all others resident in this country have a right to equal protection under the law and due process. Forced removal and indefinite imprisonment of ethnic groups (roughly 2/3 of those incarcerated were American citizens, while the rest were mostly their parents who were barred from citizenship because of racist and xenophobic anti-immigrant legislation and court decisions) was not moral or ethical then, and it is still contrary to the values in our constitution, which the country has repeatedly failed to apply equally to all those residing here. There are no reputable historians who believe forced removal and incarceration was justified. The government’s own report found that the forced removal and incarceration were a result of race prejudice, wartime hysteria, and a failure of political leadership. This is why 30 years ago Ronald Reagan signed the 1988 Civil Liberties Act, which included an official apology and reparations to Japanese American families. None of you are allowed to tell my family when they have to simply ‘move on’ from this, and the same goes for any family affected by systemic racism. The fact that we are still debating the morality of this event shows that we cannot simply ‘move on’. Reverend Shoji’s youngest daughter (my great aunt) died as a result of my family’s imprisonment due to the inhumane conditions exacerbating the problems caused by her existing disability. There are startling parallels to modern times. Carl Higbie, who was appointed by the Trump administration to the Corporation for National and Community Service (CNCS) in 2017 and previously served on the Trump campaign, explicitly referenced incarceration of Japanese Americans as a precedent for mistreating Muslims in our country. Going further back, Michelle Malkin’s very poorly written “In defense of internment” also draws its own parallels, but based on shoddy arguments suggests that persecuting both groups is justified. We remember the past so that we can remind ourselves not to repeat these mistakes. The comments here are showing why it is more important than ever to teach this history.